Welcome to Captain Ernie`s Blog! With 35 years as a fishing charter captain and guide, plus 22 years as a NYSDEC fishery biologist/manager, Capt. Ernie shares some insights and knowledge with you. I’ve fished either the ABU Garcia 7000i Synchro and the ABU Garcia Alphamar 20 Synchro, both with mechanical line counters, for years and more recently, the Altum, 20, 16, and 12 Synchros with a state of the art digital line counter, and all I can say, with one exception, is…, NICE! The 7000i Synchro is now only available in Europe, as far as I know. The Alphamar 20 and 16 have been replaced with the Altum 20, 16, and 12. I’m still using the original Garcia 7000i Synchro onboard the Fish Doctor for rigger and wire reels, along with the Alphamar 20. The new Altum 20, 16 and 12 have been onboard for about 3 years. The Altum series has performed just as well as the far more expensive and unavailable-in-the- US 7000i Synchro. The 7000i Synchro, made in Sweden has been fished on the Fish Doctor for thousands of hours and performed flawlessly except for one mechanical line counter that malfunctioned right out of the box. Like any reel, the 7000i will wear out after many season of use, with the levelwind usually the first to show wear, especially if it isn’t lubed occasionally. The Alphamar 20 and 16 Synchro, designed exactly like the7000i Synchro, but manufactured in China, had problems in their early production and are the only exception to my “Nice” review. Although the mfg bugs were finally worked out late in production, early production reels had a number of problems, most notably slightly uneven levelwind which was OK for use with 20-30 lb. mono but a nightmare when using wire. Finally, and most recently, ABU Garcia has produced the Altum series, 20, 1`6, and 12 which are, in my opinion, are the best digital line counter reels ever made for fresh water trolling. They have been in use on the Fish Doctor for 3 or so years without a gliche. The new Altum line counter also has a lighted counter window which can be turned on as needed at night or at dusk and dawn. Nice, especially for aging eyes! All of these reels have Penn’s silk smooth HT100 drag system and the Synchro feature which releases partial drag tension when the reel handle is cranked backwards ¼ turn. The Synchro drag system is a feature that every Great Lakes troller will appreciate when fishing riggers or wire/braid Dipsys or thumper rigs for trout and salmon, especially in deep water. 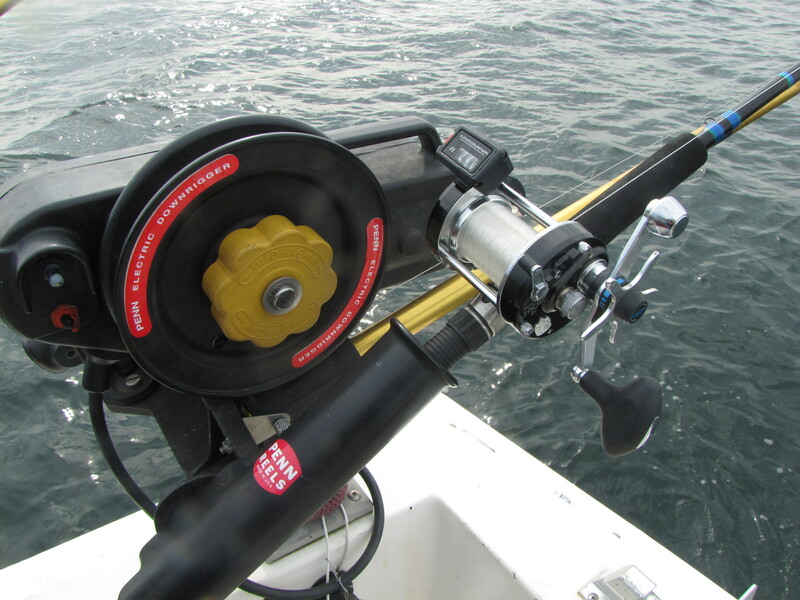 No more flipping the free spool lever and thumbing a reel or changing the setting on the star or lever drag to lower your downrigger into the depths. If you want to drop a rigger, let out a Dipsy, or lower a 1 lb. “meatball” into the depths, all you do is crank the reel handle backward ¼ of a turn and the drag automatically loosens up slightly, maintaining enough tension to keep a bend in a downrigger rod as a rigger weight drops or allow a Dipsy to drop back slowly. 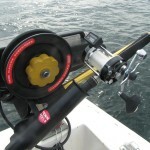 When you crank the reel handle back a ¼ turn, if the drag tension is too loose to suit you, you simple advance the reel handle forward slightly to increase the drag tension to whatever you like. If the tension is a little too heavy when the Synchro is backed off a ¼ turn, you’ll need to loosen the star drag a touch to achieve the desired release tension. What a time saver the Synchro system is! Now, when I’m dropping a rigger to 140 feet for lakers or kings, which takes a while, I no longer have to “stand at attention” with a reel in free spool and thumb the spool until the rigger reaches the right depth. All I do is crank the 7000i’s handle back a ¼ of a turn, walk away, listen for the beep on my Penn rigger signaling the rigger has stopped 140’ down, return to the rigger and crank the Synchro handle forward ¼ of a turn to the original drag setting and I’m good to go. Meanwhile, I can be netting fish, setting another rod or whatever.